The Bulgarian Army (Bulgarian: Българска армия) represents the Armed Forces of the Republic of Bulgaria. The Commander-in-Chief is the President of Bulgaria (since January 2017 Rumen Radev). The Ministry of Defence is in charge of political leadership while overall military command remains in the hands of the Defence Staff, headed by the Chief of the Defence (formerly called the Chief of the General Staff). There are three main branches, named literally the Land Forces, the Air Forces and the Naval Forces and the term "Bulgarian Army" encompasses them all together. Throughout history, the Army has played a major role in defending the country's sovereignty. Only several years after its liberation (1878), Bulgaria became a regional military power and was involved in several major wars – Serbo-Bulgarian War (1885), First Balkan War (1912–13), Second Balkan War (1913), First World War (1915–1918) and Second World War (1941–1945), during which the Army gained significant combat experience. During the Cold War the People's Republic of Bulgaria maintained one of the largest militaries in the Warsaw Pact, numbering an estimated 152,000 troops in 1988. Since the Fall of Communism, the political leadership decided to pursue a pro-NATO policy, thus reducing military personnel and weaponry. Bulgaria joined the North Atlantic Treaty Organization on 29 March 2004 and currently maintains a total 776 deployed troops in three countries. The patron saint of the Bulgarian Army is St. George. The Armed Forces Day or St. George's Day (6 May) is an official holiday in Bulgaria. The modern Bulgarian military dates back to 1878. On 22 July 1878 (10 July O.S.) a total of 12 battalions of opalchentsi who participated in the Liberation war, formed the Bulgarian armed forces. According to the Tarnovo Constitution, all men between 21 and 40 years of age were eligible for military service. In 1883 the military was reorganized in four infantry brigades (in Sofia, Pleven, Ruse and Shumen) and one cavalry brigade. The Serbo-Bulgarian War was the first armed conflict after Bulgaria's liberation. It was a result of the unification with Eastern Rumelia, which happened on 6 September 1885. 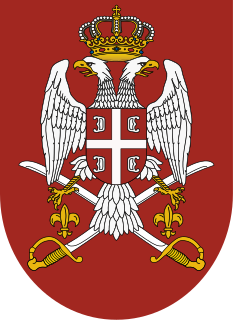 The unification was not completely recognized, however, and one of the countries that refused to recognize the act was the Kingdom of Serbia. The Austro-Hungarian Empire had been expanding its influence in the Balkans and was particularly opposed. Serbia also feared this would diminish its dominance in the region. In addition, Serbian ruler Milan Obrenović IV was annoyed that Serbian opposition leaders like Nikola Pašić, who had escaped persecution after the Timok Rebellion, had found asylum in Bulgaria. Lured by Austria-Hungary's promises of territorial gains from Bulgaria (in return for concessions in the western Balkans), Milan IV declared war on Bulgaria on 14 November 1885. Military strategy relied largely on surprise, as Bulgaria had moved most of its troops near the border with the Ottoman Empire, in the southeast. As it happened, the Ottomans did not intervene and the Serbian army's advance was stopped after the Battle of Slivnitsa. The main body of the Bulgarian army traveled from the Ottoman border in the southeast to the Serbian border in the northwest to defend the capital, Sofia. After the defensive battles at Slivnitsa and Vidin, Bulgaria began an offensive that took the city of Pirot. At this point the Austro-Hungarian Empire stepped in, threatening to join the war on Serbia's side if Bulgarian troops did not retreat. Fighting lasted for only 14 days, from 14–28 November. A peace treaty was signed in Bucharest on 19 February 1886. No territorial changes were made to either country, but Bulgarian unification was recognized by the Great Powers. Instability in the Balkan region in the early 1900s quickly became a precondition for a new war. Serbia's aspirations towards Bosnia and Herzegovina were thwarted by the Austrian annexation of the province in October 1908, so the Serbs focused their attention onto their historic cradle, Kosovo, and to the south for expansion. Greek officers, revolting in August 1909, had secured the appointment of a progressive government under Eleftherios Venizelos, which they hoped would resolve the Cretan issue in Greece's favor and reverse their defeat of 1897 by the Ottomans. Bulgaria, which had secured Ottoman recognition of its independence in April 1909 and enjoyed the friendship of Russia, also looked to districts of Ottoman Thrace and Macedonia for expansion. In March 1910 an Albanian insurrection broke out in Kosovo. In August Montenegro followed Bulgaria's precedent by becoming a kingdom. In 1911 Italy launched an invasion of Tripolitania, which was quickly followed by the occupation of the Dodecanese Islands. The Italians' decisive military victories over the Ottoman Empire greatly influenced the Balkan states to prepare for war against Turkey. Thus, in the spring of 1912 consultations among the various Christian Balkan nations resulted in a network of military alliances that became known as the Balkan League. The Great Powers, most notably France and Austria-Hungary, reacted to this diplomatic sensation by trying to dissuade the League from going to war, but failed. In late September both the League and the Ottoman Empire mobilized their armies. Montenegro was the first to declare war, on 25 September (O.S. )/ 8 October. The other three states, after issuing an impossible ultimatum to the Porte on 13 October, declared war on Turkey on 17 October. The Balkan League relied on 700,000 troops, 370,000 of whom were Bulgarians. Bulgaria, often dubbed "the Prussia of the Balkans", was militarily the most powerful of the four states, with a large, well-trained and well-equipped army. The peacetime army of 60,000 troops was expanded during the war to 370,000, with almost 600,000 men mobilized in total out of a population of 4,300,000. The Bulgarian field army consisted of nine infantry divisions, one cavalry division and 1,116 artillery units. Commander-in-Chief was Tsar Ferdinand, while the actual command was in the hands of his deputy, Gen. Mikhail Savov. The Bulgarians also possessed a small navy of six torpedo boats, which were restricted to operations along the country's Black Sea coast. Bulgaria's war aims were focused on Thrace and Macedonia. For the latter, Bulgaria had a secret agreement with Serbia to divide it between them, signed on 13 March 1912 during the negotiations that led to the establishment of the Balkan League. However, it was not a secret that Bulgaria's target was the fulfillment of the never-materialized Treaty of San Stefano, signed after the Russo-Turkish War, 1877–78. They deployed their main force in Thrace, forming three armies. The First Army, under Gen. Vasil Kutinchev with three infantry divisions, was deployed to the south of Yambol, with direction of operations along the Tundzha River. The Second Army, under Gen. Nikola Ivanov with two infantry divisions and one infantry brigade, was deployed west of the First and was assigned to capture the strong fortress of Adrianople (now Edirne). According to the plans, the Third Army, under Gen. Radko Dimitriev, was deployed east of and behind the First and was covered by the cavalry division hiding it from the Turkish view. The Third Army had three infantry divisions and was assigned to cross the Stranja mountain and to take the fortress of Lozengrad (Kirk Kilisse). The 2nd and 7th divisions were assigned independent roles, operating in western Thrace and eastern Macedonia, respectively. The first great battles were at the Adrianople–Kirk Kilisse defensive line, where the Bulgarian 1st and 3rd Armies (together 110,000 men) defeated the Ottoman East Army (130,000 men) near Gechkenli, Seliolu and Petra. The fortress of Adrianople was besieged and Kirk Kilisse was taken without resistance under the pressure of the Bulgarian Third Army. The initial Bulgarian attack by First and Third Army defeated the Turkish forces, numbering some 130,000, and reached the Sea of Marmara. However, the Turks, with the aid of fresh reinforcements from the Asian provinces, established their third and strongest defensive position at the Chataldja Line, across the peninsula where Constantinople is located. New Turkish forces landed at Bulair and Şarköy, but after heavy fighting they were crushed by the newly formed 4th Bulgarian Army under the command of Gen Stiliyan Kovachev. The offensive at Chataldja failed, too. On 11 March the final Bulgarian assault on Adrianople began. Under the command of Gen. Georgi Vazov the Bulgarians, reinforced with two Serb divisions, conquered the "untakeable" city. On 17/30 May a peace treaty was signed between Turkey and the Balkan Alliance. 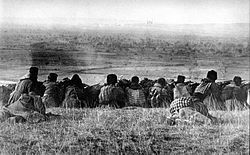 The First Balkan War, which lasted from October 1912-May 1913, strengthened Bulgaria's position as a regional military power, significantly reduced Ottoman influence over the Balkans and resulted in the formation of an independent Albanian state. The peace settlement of the First Balkan War proved unsatisfactory for both Serbia and Bulgaria. Serbia refused to cede a part of the territories in Macedonia, which it occupied and promised to give to Bulgaria according to a secret agreement. Serbia, on its side, was not satisfied with the independence of Albania and sought a secret alliance with Greece. Armed skirmishes between Serbian and Bulgarian troops occurred. On 16 June 1913, just a few months after the end of the first war, the Bulgarian government ordered an attack on Serbian and Greek positions in Macedonia, without declaring war. Almost all of Bulgaria's 500,000-man standing army was positioned against these two countries, on two fronts—western and southern—while the borders with Romania and the Ottoman Empire were left almost unguarded. Montenegro sent a 12,000-strong force to assist the Serbs. Exhausted from the previous war, which took the highest toll on Bulgaria, the Bulgarian army soon turned to the defensive. Romania attacked from the north and northeast and the Ottoman Empire also intervened in Thrace. Allied numerical superiority was almost 2:1. After a month and two days of fighting, the war ended as a moral disaster for Bulgaria, and at the same time its economy was ruined and its military demoralized. The Kingdom of Bulgaria participated in World War I on the side of the Central Powers between 15 October 1915, when the country declared war on Serbia, and 29 September 1918, when the Armistice of Thessalonica was signed. In the aftermath of the Balkan Wars, Bulgarian opinion turned against Russia and the western powers, whom the Bulgarians felt had done nothing to help them. The government of Vasil Radoslavov aligned the country with Germany and Austria-Hungary, even though this meant also becoming an ally of the Ottomans, Bulgaria's traditional enemy. However, Bulgaria now had no claims against the Ottomans, whereas Serbia, Greece and Romania (allies of Britain and France) were all in possession of lands perceived in Bulgaria as its own. In 1915 Germany promised to restore the boundaries according to the Treaty of San Stefano and Bulgaria, which had the largest army in the Balkans, declared war on Serbia in October of that year. In the First World War Bulgaria decisively asserted its military capabilities. The second Battle of Doiran, with Gen. Vladimir Vazov as commander, inflicted a heavy blow on the numerically superior British army, which suffered 12,000 casualties against 2,000 from the opposite side. One year later, during the third battle of Doiran, the United Kingdom, supported by Greece, once again suffered a humiliating defeat, losing 3,155 men against just about 500 on the Bulgarian side. The reputation of the French army also suffered badly. The Battle of the Red Wall was marked by the total defeat of the French forces, with 5,700 out of 6,000 men killed. The 261 Frenchmen who survived were captured by Bulgarian soldiers. Despite the outstanding victories, Germany was near defeat, which meant that Bulgaria would be left without its most powerful ally. The Russian Revolution of February 1917 had a great effect in Bulgaria, spreading antiwar and anti-monarchist sentiment among the troops and in the cities. In June Radoslavov's government resigned. In 1919 Bulgaria officially left the war with the Treaty of Neuilly-sur-Seine. The Treaty of Neuilly-sur-Seine proved to be a severe blow to Bulgaria's military. According to the treaty, the country had no right to organize a conscription-based military. The professional army was to be no more than 20,000 men, including internal forces and border guards. Equipping the army with tanks, submarines, bombers and heavy artillery was strictly prohibited, although Bulgaria managed to get around some of these prohibitions. Nevertheless, on the eve of World War II the Bulgarian army was still well-trained and well-equipped. The government of the Kingdom of Bulgaria under Prime Minister Bogdan Filov declared a position of neutrality upon the outbreak of World War II. Bulgaria was determined to observe it until the end of the war but it hoped for bloodless territorial gains, especially in the lands with a significant Bulgarian population occupied by neighboring countries after the Second Balkan War and World War I. However, it was clear that the central geopolitical position of Bulgaria in the Balkans would inevitably lead to strong external pressure by both World War II factions. Turkey had a non-aggression pact with Bulgaria. On 7 September 1940 Bulgaria succeeded in negotiating a recovery of Southern Dobruja with the Treaty of Craiova (see Second Vienna Award). Southern Dobruja had been part of Romania since 1913. This recovery of territory reinforced hopes for resolving other territorial problems without direct involvement in the war. The country joined the Axis Powers in 1941, when German troops preparing to invade Yugoslavia and Greece reached the Bulgarian borders and demanded permission to pass through its territory. On 1 March 1941, Bulgaria signed the Tripartite Pact and Tsar Boris III officially joined the Axis bloc. After a short period of inaction, the army launched an operation against Yugoslavia and Greece. The goal of reaching the shores of the Aegean sea and completely occupying the region of Macedonia was successful. Even though Bulgaria did not send any troops to support the German invasion of the Soviet Union, its navy was involved in a number of skirmishes with the Soviet Black Sea Fleet, which attacked Bulgarian shipping. Besides this, Bulgarian armed forces garrisoned in the Balkans battled various resistance groups. The Bulgarian government declared a token war on the United Kingdom and the United States near the end of 1941, an act that resulted in the bombing of Sofia and other Bulgarian cities by Allied aircraft. Some communist activists managed to begin a guerrilla movement, headed by the underground Bulgarian Communist Party. A resistance movement called Otechestven front (Fatherland front, Bulgarian: Отечествен фронт) was set up in August 1942 by the Communist Party, the Zveno movement and a number of other parties to oppose the elected government, after a number of Allied victories indicated that the Axis might lose the War. In 1943 Tsar Boris III died suddenly. In the summer of 1944, after having crushed the Nazi defense around Iaşi and Chişinău, the Soviet Army was approaching the Balkans and Bulgaria. On 23 August 1944 Romania quit the Axis Powers, declared war on Germany and allowed Soviet forces to cross its territory to reach Bulgaria. On 26 August 1944 the Fatherland Front made the decision to incite an armed rebellion against the government, which led to the appointment of a new government on 2 September. Support for the government was withheld by the Fatherland Front, since it was composed of pro-Nazi elements, in a desperate attempt to hold on to power. On 5 September 1944 the Soviet Union declared war and invaded Bulgaria. On 8 September 1944 the Bulgarian army joined the Soviet Union in its war against Germany. As the Red Army invaded Bulgaria in 1944 and installed a communist government, the armed forces were rapidly forced to reorganise following the Soviet model, and were renamed the Bulgarian People's Army (Bulgarska Narodna Armiya, BNA). Moscow quickly supplied Bulgaria with T-34-85 tanks, SU-100 guns, Il-2 attack planes and other new combat machinery. As the country was a Soviet satellite, it was a part of the Eastern Bloc and entered the Warsaw Pact as one of its founders. By this time the army had expanded to over 200,000 men with hundreds of thousands of more reserve troops. Military service was obligatory. A special defensive line, known as the Krali Marko defensive line, was constructed along the entire border with Turkey. It was heavily fortified with concrete walls and turrets of T-34, Panzer III and Panzer IV tanks. The army was involved in a number of border skirmishes from 1948 to 1952, repulsing several Greek attacks, and took part in the suppression of the Prague Spring events. In the meantime, during the rule of Todor Zhivkov, a significant military-industrial complex was established, capable of producing armored vehicles, self-propelled artillery, small arms and ammunition, as well as aircraft engines and spare parts. Bulgaria provided weapons and military expertise to Algeria, Yemen, Libya, Iraq, Nicaragua, Egypt and Syria. Some military and medical aid was also supplied to North Korea and North Vietnam in the 1950s and 1960s. During the 1970s the Air Force was at the apogee of its power, possessing at least 500 modern combat aircraft in its inventory. Training in the Bulgarian People's Army was exhaustive even by Soviet standards; however, it was never seen as a major force within the Warsaw Pact. In 1989, when the Cold War was coming to its end, the army (the combined number of ground, air and naval forces) numbered about 120,000 men, most of them conscripts. There were, however, a number of services which, while falling outside of Ministry of Defense jurisdiction in peacetime, were considered part of the armed forces. These were foremost the Labor Troops (construction forces), the People's Militia (the police forces of the country, which fell under Ministry of the Interior jurisdiction, but the ministry was itself a militarized structure) and, more importantly, its Interior Troops, the Border Troops—which in different periods fell under either Ministry of Defense or Ministry of the Interior control—Civil Defense Service, the Signals Troops (government communications) and the Transport Troops (mostly railway infrastructure maintenance), which were two separate services under the Postal and Communications Committee (a ministry), etc. The combined strength of the Bulgarian People's Army and all those services reached well over 325,000 troops. With the collapse of the Warsaw Pact and the end of the Cold War, Bulgaria could no longer support a vast military. A rapid reduction in personnel and active equipment was to be carried out in parallel with a general re-alignment of strategic interests. In 1990, Bulgaria had a total of more than 2,400 tanks, 2,000 armored vehicles, 2,500 large caliber artillery systems, 300 fighter and bomber aircraft, 100 trainer aircraft, more than 40 combat and 40 transport helicopters, 4 submarines, 6 fast missile craft, 2 frigates, 5 corvettes, 6 torpedo boats, 9 patrol craft, 30 minesweepers and 21 transport vessels. Due to the economic crisis that affected most former Eastern bloc countries, a steady reform in the military could not be carried out; much of the equipment fell into disrepair and some of it was smuggled and sold to the international black market. Inadequate payments, fuel and spare part shortages and the disbandment of many capable units led to an overall drop in combat readiness, morale and discipline. After partially recovering from the 1990s crisis, the Bulgarian military became a part of the collective defensive system of NATO. As a member, Bulgaria sent a total of 485 soldiers to Iraq (2003–2008) as a participant in the Iraq War, and currently maintains a 608-strong force in Afghanistan as part of ISAF. Bulgaria had a significant missile arsenal, including 67 SCUD-B, 50 FROG-7 and 24 SS-23 ballistic missiles. In 2002, Bulgaria disbanded the Rocket Forces despite nationwide protests, and has disbanded its submarine component. Bulgaria is to have 27,000 standing troops by 2014, consisting of 14,310 troops in the land forces, 6,750 in the air force, 3,510 in the navy and 2,420 in the joint command. In 2018, the Bulgarian Armed Forces numbers around 33,150 soldiers, 73 aircraft, 2234 vehicles including 531 tanks, and 29 naval assets. The Bulgarian Armed Forces are headquartered in Sofia, where most of the Defence staff is based. Until recently the supreme military institution was the General Staff and the most senior military officer was known as the Chief of the General Staff. After the latest military reform has been implemented the General Staff became a department within the Ministry of Defence and for that matter its name had to be changed to match the new situation. For that reason the former GS became the Defence Staff and the supreme military commander became the Chief of Defence. Currently headed by Chief of Defence general Simeon Simeonov, the Defence Staff is responsible for operational command of the Bulgarian Army and its 3 major branches. Deputies: Vice Admiral Petar Petrov, General Atanas Zaprianov, General Dimitar Zekhtinov. In addition to the aforementioned positions, there are general rank positions in the National Intelligence Service and the National Close Protection Service (the bodyguard service to high-ranking officials and visiting dignitaries). These two services are considered part of the Armed Forces of the Republic of Bulgaria, but are directly subordinated to the President of Bulgaria and fall out of the jurisdiction of the Ministry of Defense. With the establishment of the State Agency for National Security - SANS (Bulgarian: Darzhavna Agentsiya za Natsionalna Sigurnost - DANS, Държавна агенция за национална сигурност - ДАНС) part of the military security personnel came under its authority. Before that the security aspects of the armed forces were handled by a unified organisation under the General Staff - the "Military Service of Security and Military Police". After the formation of SANS the service was split, with the military counter-intelligence personnel entering the newly formed structure and the military police personnel staying under Ministry of Defense subordination. While technically civilian servants not part of the armed forces, the military counter-intelligence personnel of the State Agency of National Security retain their military ranks. The Commandment Service is an institution in charge of real estate management, transportation, library services, documentation publishing and communications support for the central administration of the MoD, transportation support to the immediate MoD personnel, classified information, cryptographic and perimeter security for the MoD administration buildings. Joint Forces Training Range "Novo Selo"
National Military Study Complex "Charalitsa"
The 68th Special Forces Brigade left the Land Forces on February 1, 2017, de facto becoming the country's fourth combat service. Unlike Bulgaria's Land, Air and Naval Forces however it falls outside of the Joint Forces Command structure, having been assigned directly under the authority of the Chief of Defence. Bulgaria's total military personnel as of 2014 is 37,100, of which 30,400 (80.1%) are active military personnel and 8,100 (11.9%) are civilian personnel. The Land Forces are the largest branch, with at least 18,000 men serving there. In terms of percentage, 53% of all Army personnel are in the Land Forces, 25% are in the Air Force, 13% are in the Navy and 9% are in the Joint Forces Command. Annual spending per soldier amounts to 30,000 leva (~ 15,000 euro) and is scheduled to increase to 43,600 leva by 2014. Unlike many former Soviet bloc militaries, discipline and morale problems are not common. During the Communist era, the army members enjoyed extensive social privileges. After the fall of Communism and Bulgaria's transition to a market economy, wages fell severely. For almost a decade social benefits were virtually non-existent, and some of them have been restored but recently. Nikolai Tsonev, defence minister under the 2005–2009 cabinet, undertook steps to provide the members of the military and their families with certain privileges in terms of healthcare and education, and to improve living conditions. The Land Forces practice extensive year-round military training in various conditions. Cooperative drills with the United States are very common, the last series of them conducted in 2008. Bulgaria's most recent full-scale exercise simulating a foreign invasion was carried out in 2009. It was conducted at the Koren range, and included some 1,700 personnel with tanks, ATGMs, attack aircraft, AA guns and armored vehicles. The combat skills of individual soldiers are on a very high level, on par with troops of the U.S. Army. Until recent years the Air Force suffered somewhat from fuel shortages; a problem which was overcome in 2008. Fighter pilots have year-round flights, but gunship pilots do not fly often due to the yet unfulfilled modernization of the Mi-24 gunships. Due to financial difficulties fighter pilots have 60 hours of flying time per year, only a third of the national norm of 180 hours. The Navy also has some fuel shortage problems, but military training is still effective. The most recent overseas operation of the Navy was along the coast of Libya as part of Operation Unified Protector. After the collapse of the Warsaw pact, Bulgaria lost the ability to acquire cheap fuel and spares for its military. A large portion of its nearly 2,000 T-55 tanks fell into disrepair, and eventually almost all of them were scrapped or sold to other countries. In the early 1990s the budget was so small, that regulars only received token-value payments. Many educated and well-trained officers lost the opportunity to educate younger soldiers, as the necessary equipment and basis lacked adequate funding. Military spending increased gradually, especially in the last 10 years. As of 2005, the budget was no more than $400 mln., while military spending for 2009 amounted to more than $1.3 bln. – almost a triple increase for 4 years. Despite this growth, the military still does not receive sufficient funds for modernization. An example of bad spending plans is the large-scale purchasing of transport aircraft, while the Air Force has a severe need of new fighters (the MiG-29s, even though modernized, are nearing their operational limits). The planned procurement of 2–4 Gowind class corvettes has been cancelled. As of 2009, military spending were about 1.98% of GDP. In 2010 the budget is to be only 1.3% due to the international financial crisis. The Land Forces are functionally divided into Deployable and Reserve Forces. Their main functions include deterrence, defence, peace support and crisis management, humanitarian and rescue missions, as well as social functions within Bulgarian society. Active troops in the land forces number about 18,000 men, and reserve troops number about 13,000. The equipment of the land forces is impressive in terms of numbers, but most of it is nonoperational and scheduled to be scrapped or refurbished and exported to other nations. Bulgaria has a military stockpile of about 5,000,000 small arms, models ranging from World War II-era MP 40 machine pistols to modern Steyr AUG, AK-74, HK MP5, HK416 and AR-M12F assault rifles. The National Guard of Bulgaria, founded in 1879, is the successor to the personal guards of Knyaz Alexander I. On 12 July of that year, the guards escorted the Bulgarian knyaz for the first time; today the official holiday of the National Guard is celebrated on 12 July. Throughout the years the structure of the guards has evolved, going from convoy to squadron, to regiment and, subsequent to 1942, to division. Today it includes military units for army salute and wind orchestra duties. In 2001, the National Guard unit was designated an official military unit of the Bulgarian army and one of the symbols of state authority, along with the flag, the coat of arms and the national anthem. It is a formation, directly subordinate to the Minister of Defence and while legally part of the armed forces, it is totally independent from the Defence Staff. Note: This table represents active equipment only; there are large numbers of equipment in reserve status. They are not listed here. The Navy has traditionally been the smallest component of the Bulgarian military. Established almost simultaneously with the Ground forces in 1879, initially it consisted of a small fleet of boats on the Danube river. Bulgaria has a coastline of about 354 kilometers – thus, naval warfare is not considered a priority. After the downturn in 1990, the Navy was largely overlooked and received almost no funding. No projects for modernization were carried out until 2005, when a Wielingen class frigate (F912 Wandelaar) was acquired from Belgium. By 2009, Bulgaria acquired two more frigates of the same class. The first of them was renamed 41 Drazki and took part in several operations and exercises, most notably the UNIFIL Maritime Patrol along the coast of Lebanon in 2006, and Operation Active Endeavour. It also participated in the enforcement the naval blockade against Muammar Gaddafi's regime off the coast of Libya in 2011 until 2012. The equipment is typical for a small navy, consisting mostly of light multi-purpose vessels – 4 frigates, 3 corvettes, 5 minesweepers, 3 fast missile craft and 2 landing ships. Other equipment includes a coastal defence missile battalion armed with locally modified P-15 Termit missiles, a coastal artillery battery, a naval helicopter airbase and a marine special forces unit. The Bulgarian Navy is centered in two main bases – in Varna and in Burgas. In the past decade Bulgaria has been trying actively to restructure its army as a whole and a lot of attention has been placed on keeping the aging Russian aircraft operational. Currently the attack and defence branches of the Bulgarian air force are mainly MiG-21s, MiG-29s and Su-25s. About 16 MiG-29 fighters have been modernized in order to meet NATO standards. The first aircraft arrived on 29 November 2007 and final delivery was due in 03/09. In 2006 the Bulgarian government signed a contract with Alenia Aeronautica for the delivery of five C-27J Spartan transport aircraft in order to replace the Soviet made An-24 and An-26, although the contract was later changed to only three aircraft. Modern EU-made transport helicopters were purchased in 2005 and a total of 12 Eurocopter Cougar have been delivered (8 transport and 4 CSAR).3 Eurocopter AS565 Panther for the Bulgarian navy in 2016. Branches of the airforce include: fighter aviation, assault aviation, intelligence aviation and transportation aviation, aid defence troops, radio-technical troops, communications troops, radio-technical support troops, logistics and medical troops. The Bulgarian ministry of defense has announced plans to withdraw and replace the MiG-21 fighters with new ones. Several offers were received from international suppliers – the United States (offering F-16 Fighting Falcon and F-18 Super Hornet), Sweden JAS-39 Gripen), Germany (Eurofighter Typhoon), Italy (second-hand Eurofighter Typhoon), Russia (MiG-29) and Israel (IAI Kfir). With the exception of the Navy's small helicopter fleet, the Air Forces are responsible for all military aircraft in Bulgaria. The Air Forces' inventory numbers 124 aircraft, including 46 combat jets and 42 helicopters. Aircraft of western origin have only begun to enter the fleet, numbering 13 of the total in service. The Bulgarian-American Joint Military Facilities were established by a Defence Cooperation Agreement signed by the United States and Bulgaria in April 2006. Under the agreement, U.S. forces can conduct training at several bases in the country, which remain under Bulgarian command and under the Bulgarian flag. Under the agreement, no more than 2,500 U.S. military personnel can be located at the joint military facilities. Foreign Policy magazine lists Bezmer Air Base as one of the six most important overseas facilities used by the USAF. Both during Communist rule and after, Bulgaria has deployed troops with different tasks in various countries. The table below lists Bulgarian military deployments in foreign countries. Active missions are shown in bold. Wikimedia Commons has media related to Military of Bulgaria. ^ "NATIONAL PLAN FOR INCREASING THE DEFENSE SPENDING TO 2% OF THE GROSS DOMESTIC PRODUCT UNTIL 2024" (PDF). www.md.government.bg. Sofia. 2017. Archived from the original (PDF) on 11 September 2018. Retrieved 11 September 2018. ^ "Bulgaria – Military Personnel". Lcweb2.loc.gov. Retrieved 15 October 2017. ^ "The Project Gutenberg eBook of THE INSIDE STORY OF THE PEACE CONFERENCE, by Dr. E.J. Dillon". Mirrorservice.org. Retrieved 15 October 2017. ^ "Bulgaria - Table A. Chronology of Important Events". Country-data.com. Retrieved 15 October 2017. ^ "Ground Forces". Lcweb2.loc.gov. Retrieved 15 October 2017. ^ "Air and Air Defense Forces". Lcweb2.loc.gov. Retrieved 15 October 2017. ^ "Naval Forces". Lcweb2.loc.gov. Retrieved 15 October 2017. ^ "Ministry of Defence of the Republic of Bulgaria". Mod.bg. Retrieved 15 October 2017. ^ "Institut Po Otbrana". Mod.bg. Retrieved 15 October 2017. ^ БНТ2-Пловдив. "68-а бригада "Специални сили" в Пловдив вече е самостоятелна бойна единица". Новини БНТ. Retrieved 15 October 2017. ^ "White Book of the Defense Forces" (PDF). Mod.bg. Retrieved 15 October 2017. ^ "Bulgarian arms imports, 2009 calendar year". UNODA. Retrieved 14 June 2013. ^ "Arms Sales, Library of Congress". Lcweb2.loc.gov. Retrieved 15 October 2017. ^ "Military Cooperation and Exchanges". Lcweb2.loc.gov. Retrieved 15 October 2017. ^ "Тroop contributions to ISAF" (PDF). ISAF official website. Archived from the original (PDF) on 16 August 2014. Retrieved 7 April 2016. Бяла книга на Въоръжените сили (White Paper of the Armed Forces), Ministry of Defence of Bulgaria, 2011.
http://www.mediafire.com/download/heyrxhrnpqx06mz/Bulgarian_Military.docx and http://www.mediafire.com/download/ba571l7jiid2tf8/Bulgarian+Military.pdf - Download the word file and a pdf file for the Bulgarian Military's equipment list and specific details. The Armed Forces of Bosnia and Herzegovina is the official military force of Bosnia and Herzegovina. The BiH Armed forces were officially unified in 2005 and are composed of two founding armies: the Bosniak-Croat Army of the Federation of Bosnia and Herzegovina and the Bosnian Serbs' Army of Republika Srpska (VRS). The Armed Forces of the Republic of Kazakhstan is the unified armed forces of Kazakhstan. It consists of the Ground Forces, Air and Air Defence Forces, Naval Forces, and Republican Guard. The national defence policy aims are based on the Constitution of Kazakhstan. They guarantee the preservation of the independence and sovereignty of the state and the integrity of its land area, territorial waters and airspace and its constitutional order. The armed forces of Kazakhstan act under the authority of the Kazakhstan Ministry of Defence. The Kuwait Military Forces consists of several joint forming defense forces. The governing bodies are the Kuwait Ministry of Defense, the Kuwait Ministry of Interior, the Kuwait National Guard and the Kuwait Fire Service Directorate. The Emir of Kuwait is the commander-in-chief of all defense forces and the Crown Prince is the deputy commander. The Second Balkan War was a conflict which broke out when Bulgaria, dissatisfied with its share of the spoils of the First Balkan War, attacked its former allies, Serbia and Greece, on 16 (O.S.) / 29 (N.S.) June 1913. Serbian and Greek armies repulsed the Bulgarian offensive and counter-attacked, entering Bulgaria. With Bulgaria also having previously engaged in territorial disputes with Romania, this war provoked Romanian intervention against Bulgaria. The Ottoman Empire also took advantage of the situation to regain some lost territories from the previous war. When Romanian troops approached the capital Sofia, Bulgaria asked for an armistice, resulting in the Treaty of Bucharest, in which Bulgaria had to cede portions of its First Balkan War gains to Serbia, Greece and Romania. In the Treaty of Constantinople, it lost Edirne to the Ottomans. Field Marshal Michael John Dawson Walker, Baron Walker of Aldringham, is a retired British Army officer. Commissioned in 1966, he served in Cyprus, Northern Ireland, and in a variety of staff posts in the United Kingdom until 1984. After being given command of a battalion, he was mentioned in despatches for his service during a second tour of duty in Northern Ireland, this time in Derry, and subsequently served a tour on Gibraltar. He was promoted to brigadier, unusually having never held the rank of colonel, and took command of 20th Armoured Brigade in Germany before becoming I Corps chief of staff. 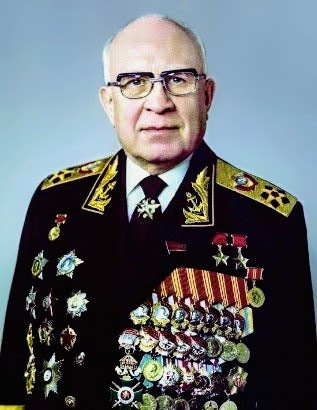 Sergey Georgyevich Gorshkov was an admiral of the fleet of the Soviet Union. Twice awarded the title Hero of the Soviet Union, he oversaw the expansion of the Soviet Navy into a global force during the Cold War. The military ranks of the Soviet Union were those introduced after the October Revolution of 1917. At that time the Imperial Russian Table of Ranks was abolished, as were the privileges of the pre-Soviet Russian nobility. Field Marshal Radomir Putnik was the first Serbian Field Marshal and Chief of the General Staff of the Serbian army in the Balkan Wars and in the First World War. He took part in all of the wars in which Serbia took part between 1876 to 1917. The Bulgarian Land Forces are the ground warfare branch of the Bulgarian Armed Forces. The Land Forces were established in 1878, when they were composed of anti-Ottoman militia (opalchentsi) and were the only branch of the Bulgarian military. The Land Forces are administered by the Ministry of Defence, previously known as the Ministry of War during the Kingdom of Bulgaria. The Land Forces, Air Force and Naval Forces of Romania are collectively known as the Romanian Armed Forces. The current Commander-in-chief is General Nicolae Ionel Ciuca who is managed by the Minister of National Defence while the president is the Supreme Commander of the Armed Forces during wartime. The Ministry of Defence is the department of the Government of Spain responsible for planning, developing and carrying out the general guidelines of the Government about the defence policy and the managing of the military administration. It is the administrative and executive body of the Spanish Armed Forces. The Chief of Staff of the Defence Forces (COS) is charged with the executive management of the Irish Defence Forces, and is the most senior military officer of the Army, Naval Service and Air Corps branches. The Chief of Staff is appointed by the President of Ireland, who is the Supreme Commander of the Defence Forces, on the recommendation of the Minister for Defence subject to the approval of the Government of Ireland. The office of the Chief of Staff consists of his personal staff, a strategic planning office and a public relations section.